Thanks to Laurel Ann for asking us to participate in her Pride and Prejudice Without Zombies event! An author—especially a talented and clever one like Jane Austen—subtly imparts information about her characters with details such as their occupation, their mode of conversation, and even something seemingly so minor as their carriage. In Pride and Prejudice, the alert reader can pick up information not only about the characters but about the plot itself from the type of carriage used by a character in a particular situation. In Jane Austen’s day, a carriage was definitely a luxury item. They were expensive to purchase, naturally, and there were ongoing expenses in repair, storage, coachmen to care for and operate them, and the ongoing expenses of maintaining or renting horses to pull them; so it was a matter of interest to the impertinently nosy whether a person kept a carriage, and what kind. It was almost a method of broadcasting one’s wealth to the world. Not that he isn’t capable of snobbery, but one suspects Mr. Darcy doesn’t particularly care about Mrs. Long and her carriage or lack thereof, and had plenty of other reasons not to talk to that lady at the Meryton assembly. Mrs. Bennet is here perhaps passing off her own personal snobbery onto Darcy. The Bennets keep a carriage; we aren’t told what kind, but we can probably assume it is a closed vehicle that can seat six to eight people—quite proper for a large family like the Bennets. Mr. Bennet does not keep horses solely to pull the carriage; he borrows working animals from the home farm for carriage duty. That detail not only shows that the Bennets are not extremely rich, but allows for the plot twist of Jane Bennet riding horseback to Netherfield, getting caught in the rain, and catching a cold that allows Jane and her sister Elizabeth to get to know Messrs. Bingley and Darcy a little better—and vice-versa. Lady Catherine seems to be a bit of a carriage snob. Among her impertinent questions to Elizabeth are questions about the kind of carriage her father owns. She asked her at different times, how many sisters she had, whether they were older or younger than herself, whether any of them were likely to be married, whether they were handsome, where they had been educated, what carriage her father kept, and what had been her mother’s maiden name? — Elizabeth felt all the impertinence of her questions, but answered them very composedly. Mr. Bingley is young and unmarried, but has sisters to cart around, so he travels in a chaise and four (meaning it is pulled by four horses) to Netherfield to look over the property, and brings his sister to Netherfield in the same vehicle. A chaise is a closed carriage that seats two to three people. There is no driver, but one or more postilions will ride the lead horse(s) to steer the chaise. A chaise and four is a fashionable and fast way to travel. Presumably Bingley keeps his own horses specifically to use for the chaise, but his brother-in-law Hurst, who has his own chaise, does not. The aforementioned hack chaise that conveyed the unfortunate Mrs. Long to the Meryton assembly was hired for the occasion. Most larger villages had a livery stable that would hire out, or “hack,” such vehicles and horses for a particular event. A most obliging invitation; are they to draw straws to decide who gets to ride? And what is the other young lady supposed to do? Spare some pity for poor Dawson, presumably Lady Catherine’s maid, who is stuck up on the box with the driver in whatever weather might be going on. At least it’s warm in June, but if it rains, there is no protection. And no doubt Lady C. would have made Lizzy and Maria ride facing backwards, not shaded by the top. It’s telling that when Lady Catherine travels to Longbourn to berate Lizzy for using her arts and allurements, she travels in a chaise with post horses. One morning, about a week after Bingley’s engagement with Jane had been formed, as he and the females of the family were sitting together in the dining room, their attention was suddenly drawn to the window, by the sound of a carriage; and they perceived a chaise and four driving up the lawn. It was too early in the morning for visitors, and besides, the equipage did not answer to that of any of their neighbours. The horses were post; and neither the carriage, nor the livery of the servant who preceded it, were familiar to them. Since it is accompanied by a liveried servant, presumably the carriage is Lady Catherine’s own property; but the horses at least are post, meaning that they do not belong to Lady Catherine, but were rented and swapped out for fresh horses every twenty miles or so along the way, so that she did not have to wait for her own horses to be baited, or fed and rested. While faster, this way of travel would be more expensive than simply using one’s own horses and resting them as needed. This indicates that Lady Catherine was in a big hurry to get to Longbourn and find out if Elizabeth and Darcy were engaged—big enough to do away with habits of economy. When Lydia and Wickham elope together, they start out by post-chaise, but transfer to a hackney-coach when they reach Clapham, at that time a suburb of London but now part of the city. A hackney-coach is the equivalent of a modern-day taxi: a horse and carriage for hire to take you a short distance to your destination; thus Mr. Bennet could guess that the eloping couple had completed their journey in London. The coach itself would likely have been an old vehicle, castoff by its original owner, and could be any type of vehicle that has a box for a driver, who was known as a jarvey. Hackney coaches within London were licensed and assigned registration numbers, which would allow Mr. Bennet to trace the driver and, in the case described above, hopefully learn where he had set down, or delivered, Lydia and Wickham. Young people seemed to like to drive their own vehicles. Even the sickly Miss de Bourgh has her own phaeton and ponies. A phaeton was a four-wheeled vehicle that seated two, one of whom drove the horses pulling it. Pray forgive me if I have been very presuming, or at least do not punish me so far as to exclude me from P. I shall never be quite happy till I have been all round the park. A low phaeton, with a nice little pair of ponies, would be the very thing. In Georgette Heyer novels, we often read of the more dashing heroines driving a high-perch phaeton, which also has four wheels, but the box is suspended high over the front axle. It is a fast and fun vehicle to drive, but like a modern SUV, has a higher center of gravity, making it more likely to overturn, especially when pulled by the high-couraged cattle that would make such a sporty vehicle worth owning. Younger gentlemen’s personal vehicles were usually either a gig or a curricle. These fast, sporty carriages were similar in being open vehicles with two wheels, seating two comfortably, and driven by one of the passengers; the main difference being that a gig was equipped to be pulled by one horse and a curricle by two, thereby doubling the horsepower—a Trans Am to the gig’s Firebird, if you will. Mr. Collins, predictably, owns a gig, in which he takes Sir William driving while he is visiting Hunsford. Mr. Darcy, also predictably, owns a curricle, which he uses to drive Georgiana to visit Elizabeth at the inn in Lambton. Marriage, the inevitable ending of a Jane Austen novel, not only rhymes with carriage, but often precipitated the purchase of a new equipage for the new family unit; certainly the two are linked in Mrs. Bennet’s mind. It was a fortnight since Mrs. Bennet had been down stairs, but on this happy day she again took her seat at the head of her table, and in spirits oppressively high. No sentiment of shame gave a damp to her triumph. The marriage of a daughter, which had been the first object of her wishes since Jane was sixteen, was now on the point of accomplishment, and her thoughts and her words ran wholly on those attendants of elegant nuptials, fine muslins, new carriages, and servants. Instead of worrying about her youngest daughter’s morals, she worries about her carriages, without understanding that the Wickhams will little be able to afford one. Poor Jane! And poor Mrs. Bennet, declaring her main project of the past two years “nothing at all!” We like to think that Mrs. Darcy and Mrs. Bingley had the best carriages that money could buy at their command; their doting husbands would have it no other way. Lane, Maggie. 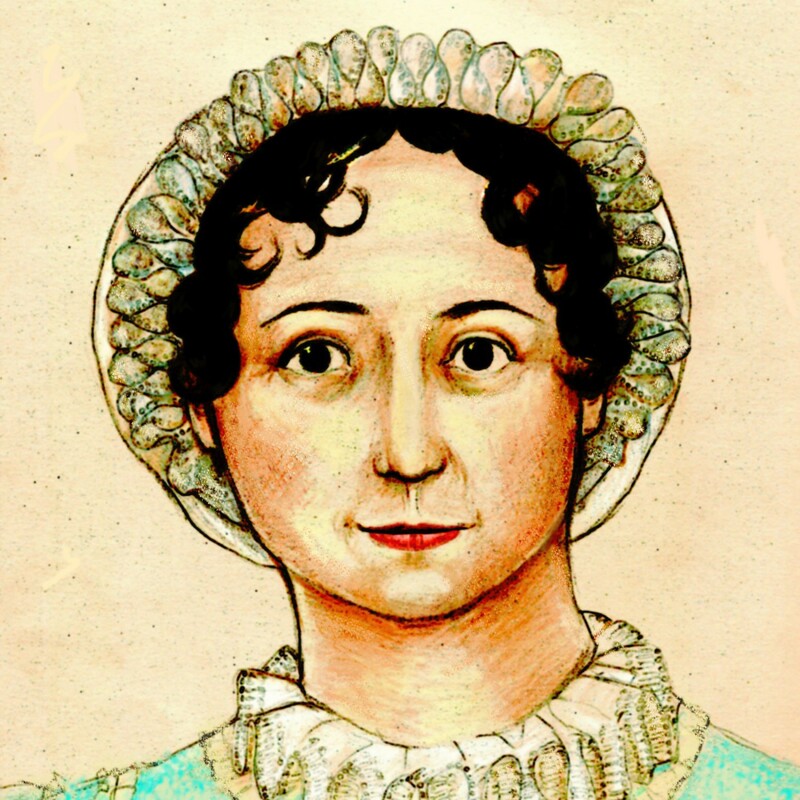 Jane Austen’s World: The life and times of England’s most popular author. Holbrook, Massachusetts: Adams Media Corporation, 1996. Watkins, Susan. Jane Austen in Style. London: Thames and Hudson Ltd., 1990. Brilliant Mags. So well researched and quoted. The thought of Anne de Bourgh in a runaway carriage does make me giggle a bit though. I would be even more pleased if one of her ponies had the good sense to bite her mother. Thanks again. This is a wonderful resource. Thing is, a horse is much bigger than a pony and therefore a pony is easier to get under control if it should run away–as it takes brute strength to do that. Donkeys were considered the safest animals of all to pull a cart, though of course vulgar and only fit for the country, but they are certainly stubborn creatures as well. Young ladies would not ride a male horse, incidentally, even a gelding; only a mare. But I don’t think it matters for carriage horses. Yes, the quote is that Dawson does not object to the barouche box, which I read as “doesn’t object to riding on the barouche box,” which makes me think that the barouche box was not Dawson’s normal seat. Why in the world would the driver object to sitting on the box? The box is the place where the driver sat, just to be clear. Maybe I should add that to the post. Many carriages didn’t have them–chaises (because they used postilions who were actually riding the horses), and curricles, gigs, and phaetons were all driven from the passenger seat. So many subtle clues that we modern readers miss! Thank you, Mags, for pointing out these clues! Mr Bennet’s use of farm horses for his carriage may have had another purpose. Horses used exclusively to draw carriages were one of the many items that were liable to be taxed, but agricultural horses were exempt. If Mr Bennet can show that his horses are not only for leisure use he won’t need to pay taxes on them. This tax is also the likely reason that the Hursts keep no carriage horses but hire them as needed, and that Mr Knightley does the same. Splendid work again, Mags. I’ve really been enjoying your recent longer posts about Austen’s world–and I’ve been enjoying the whole P&P w/o Z event on Austenprose as well. I know that your focus here had to be on P&P, but I’m sure that you must have been tempted to add the various passages about carriages from NA as well! Of these, a favorite of mine is John Thorpe’s boasting about his gig: “Curricle-hung you see; seat, trunk, sword-case, splashing-board, silver moulding, all you see complete; the iron-work as new, or better.” Sounds as if Oxford had at least one “Pimp My Ride” establishment for undergraduates who were short on both sense and money. Thank God someone explained. I thought phaetons were horses. Ha! This is brilliantly written and I thank you on that. These could be my second favorite post next to the gowns. So informative! Especially to those like me who has no idea about any of these. What a fascinating and useful article! After I read it yesterday, my husband and I watched Sense and Sensibility in the evening and I amazed him by being able to name the various carriages used in the film. Both horses and carriages were taxed, horses at around 30 shillings a head and carriages, depending on size, several pounds each. A very enjoyable article Mags! mid-13c., from Anglo-Fr. catel “property,” from M.L. capitale “property, stock,” neut. of L. capitalis “principal, chief,” from caput “head” (see head). Original sense was of moveable property, especially livestock; not limited to “cows” until 1550s.